With a background in film, animation, and video, Gamaal Wilson has pursued a career in media & entertainment consulting. filled with adventure and excitement. 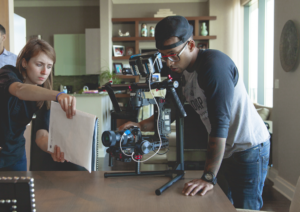 In a world where everyone wants and expects their content “on-demand”, filmmakers and media directors must work in innovative ways to have their work stand out above the rest. Today, consumers have access to pretty much everything they want right at their fingertips whether it is movies, tv shows, documentaries, or anything in between. In an ever-evolving industry, it can be nearly impossible to pay attention to all of the current updates and trends happening in media and entertainment while also focusing on creating your own unique content. Before establishing his consulting career, Gamaal worked as a production assistant and coordinator on a wide range of film production projects. He earned a joint-degree from Brown University and Rhode Island School of Design (RISD) with a Bachelor of Arts degree and Bachelor of Fine Arts degree studying Film, Animation, and Video (FAV). The International Alliance of Theatrical State Employees (IATSE) was founded in 1893 and now represents over 130,000 individuals in the media & entertainment industry. Gamaal Wilson is proud to be part of a group that has done so much to evolve and expand the industry with new entertainment mediums, technological innovation, and creative growth.